In today’s busy culture, the ability to multitask is considered one of the most valuable skills to possess. We pride ourselves on being able to handle two or more mental functions at the same time. The thing is, research shows that, in reality, that can’t be done. Our brains are not wired that way. That’s why talking on a cell phone, even a hands-free device, while driving is simply not safe. Many of us do it and think we’re perfectly capable of holding a cell phone conversation and driving simultaneously. Maybe we’ve done it a hundred times with no negative consequences. Or maybe you’re like me and can see how drivers on the phone are not really paying attention to what they’re doing. It makes me crazy! If you have any doubts, read this White Paper published by the National Safety Council.1 It’s all about the “distracted brain,” and it explains, with supporting research, why talking on a cell phone while driving is very risky behavior. Part of the problem comes from a condition called inattention blindness. When it comes to safe driving, vision is critical. 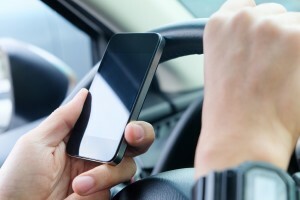 Drivers on the phone tend to “look,” but not “see.” In fact, estimates indicate that these drivers fail to see up to 50 percent of the information in their driving environment, including pedestrians and red lights. That’s inattention blindness. You see, our brains simply cannot perform two complex tasks at one time, like conversing on the phone and driving a vehicle. Rather, they switch from one function to another, performing one task at a time. It happens very quickly, which gives us the feeling we’re doing two things at once, but there’s a fraction of a second delay as the brain switches focus. A fraction of a second affects reaction time and could mean the difference between a crash and a near miss, a death and a saved life. Many people think hands-free devices and the built-in Bluetooth features found in most new cars are safer. After all, your hands stay on the wheel and your eyes on the road. Still, and the research cited in the National Safety Council White Paper supports this, your brain is distracted with the conversation and not focused totally on the task of driving. The conclusion: hands-free devices are no cure for inattention blindness. You’ll find little argument that texting while driving is a serious safety risk, but National Safety Council data show drivers on cell phones are involved in more accidents. Of course, more people talk on cell phones than text. The National Highway Traffic Safety Administration estimates that at any point during the day, nine percent of drivers are using cell phones. That figure is significant because the danger affects not only those nine percent, but also the hundreds of vehicles on the road with them. Drivers on cell phones are not only inattention blind, they’re also less aware of their presence on the road. They’re more likely to stray out of their lanes and miss important traffic signs, making them a hazard to other drivers as well as themselves. The research cited in the National Safety Council White Paper concludes that the risk of crashing while driving and talking on a cell phone – handheld or hands-free – is about four times greater than when not using a cell phone. Is that enough for you to hang up until you get home?